Precedent transaction analysis is used to derive an implied market valuationValuation MethodsWhen valuing a company as a going concern there are three main valuation methods used: DCF analysis, comparable companies, and precedent transactions. 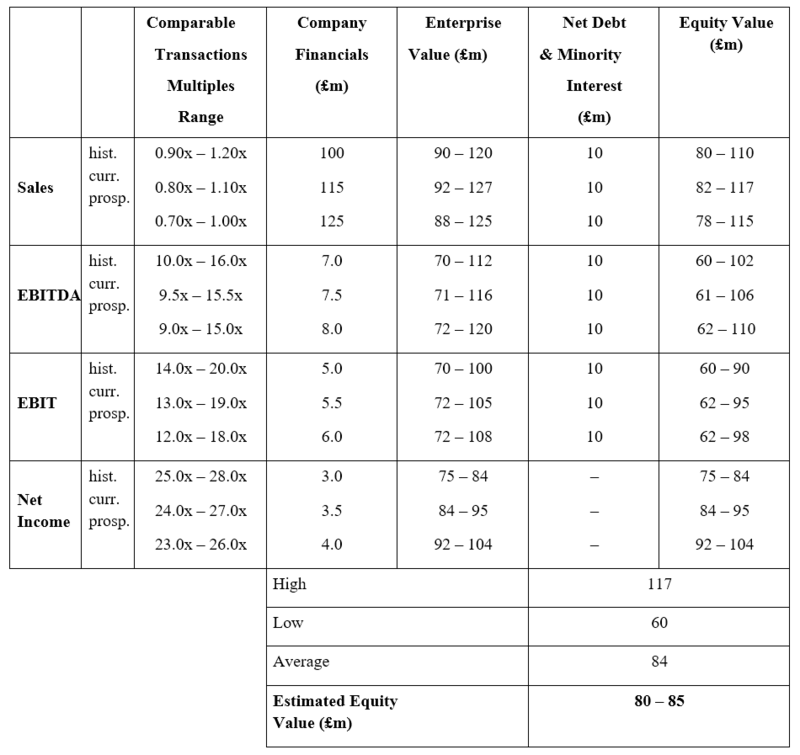 These methods of valuation are used in investment banking, equity research, private equity, corporate development, mergers & acquisitions, leveraged buyouts and finance for a company, either public or private, in an acquisitionMerger Consequences AnalysisMerger consequences analysis assesses the financial impact a merger or acquisition may have on a company. These must be carefully considered before context. Essentially, a precedent transaction takes the point of view of the acquirer from previous M&A dealsMergers Acquisitions M&A ProcessThis guide takes you through all the steps in the M&A process. Learn how mergers and acquisitions and deals are completed. In this guide, we'll outline the acquisition process from start to finish, the various types of acquirers (strategic vs. financial buys), the importance of synergies, and transaction costs to see how much it cost to acquire a similar business. From past deals, valuation multiplesTypes of Valuation MultiplesThere are many types of valuation multiples used in financial analysis. 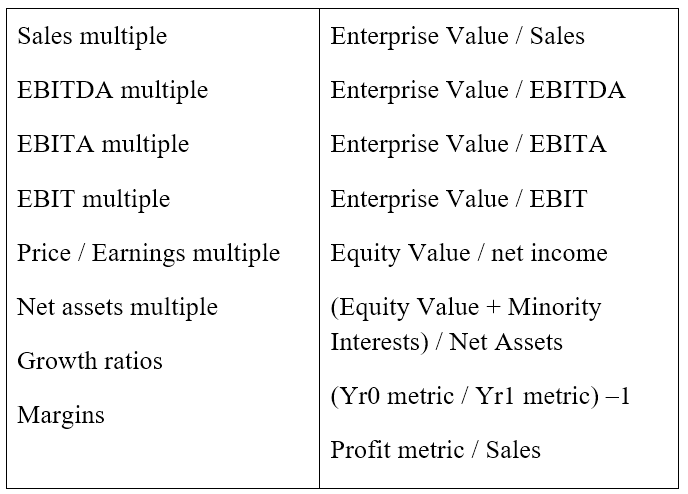 These types of multiples can be categorized as equity multiples and enterprise value multiples. They are used in two different methods: comparable company analysis (comps) or precedent transactions, (precedents). See examples of how to calculate can be derived by dividing the transaction value by the target company’s financials. The valuation multiples are applied to the company being valued in order to give a theoretical value of the business. This is an excerpt from CFI’s free investment banking manualInvestment Banking ManualCFI's Investment Banking book is free, available for anyone to download as a PDF. Read about accounting, valuation, financial modeling, Excel and all skills required to be an investment banking analyst. This manual is 466 pages of detailed instruction every new hire at a bank needs to know to succeed on how to be an analyst. For deferred consideration, ensure the terms of how it has been created are noted. Include both values and the range of multiples. The equity and enterprise values are always for 100% of the target company. If Bidder buys 50% of Target, the equity and enterprise values are the implied values for the entire company. Buying 50% of a company for $10,000,000 implies that the company is worth $20,000,000. If Bidder buys less than 100%, the amount paid represents a portion of the equity value. Enterprise value is calculated by grossing up the equity value to 100% and adding net debt. However, if Bidder buys all of Target, the Bidder will also assume all of Target’s liabilities, and what is described as “amount paid” might or might not include the debt. It is important to understand what the amount paid represents to avoid calculating incorrect transaction multiples. All profitable options are excisable upon acquisitions and should be converted when calculating equity and enterprise value. Valuation multiples can be derived by dividing the transaction value by the target company’s financials. For private transactions, by looking at historic precedent transactions, valuation multiples can be derived by dividing the transaction value by the target company’s financials (or other metrics such as subscribers, square feet, etc.). For a public company transaction, the premium paid alludes to the fact that a bidder will typically pay a premium above the market valuation to obtain control over the target, the takeover premium. Identify highest and lowest likely prices. Comparable multiples should be checked with the broker to see if they are reasonable. Footnotes should be used for all assumptions and points of interest. A block of shares providing some level of control may be worth more than the sum of the values of the single shares, so transaction multiples are higher than the trading multiples of the company. Premiums are more expensive for larger shares of control (the premium for 100% of a company is significantly more than for 5% of a company). The ability to control a company has a value, but value in a corporate sense must be represented by future cash flows. 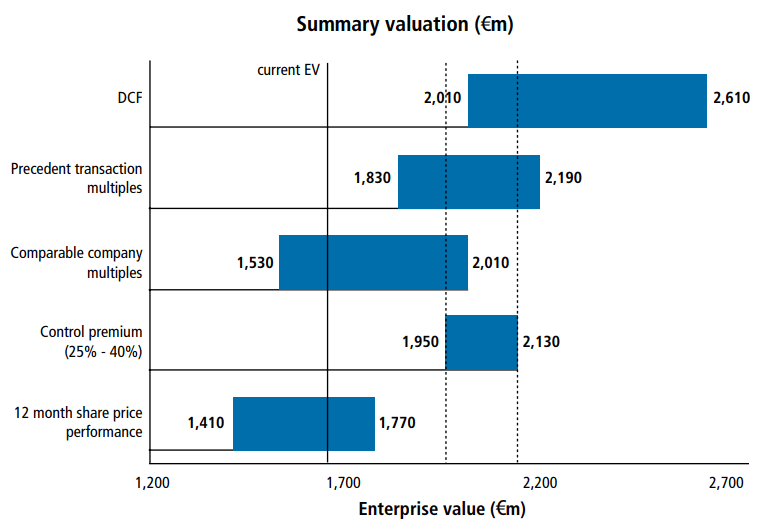 When the equity markets value a company, they are assessing the PV of its future cash flows. The PV of future cash flows is the underlying reason for a takeover. Synergies mean that cash flows discounted by bidders are higher than the cash flows being discounted by the market (or current owner). This, therefore, sets a limit on how much the bidder can pay. If the acquisition is going to add any value to the bidder, then the amount actually paid is generally less than this maximum. Precedent transaction multiples are impacted by the split of the value of synergies between target and bidder. A Leveraged Buyout (LBO) is conducted by using a significant amount of borrowed money to meet the cost of acquisition of an acquiree. 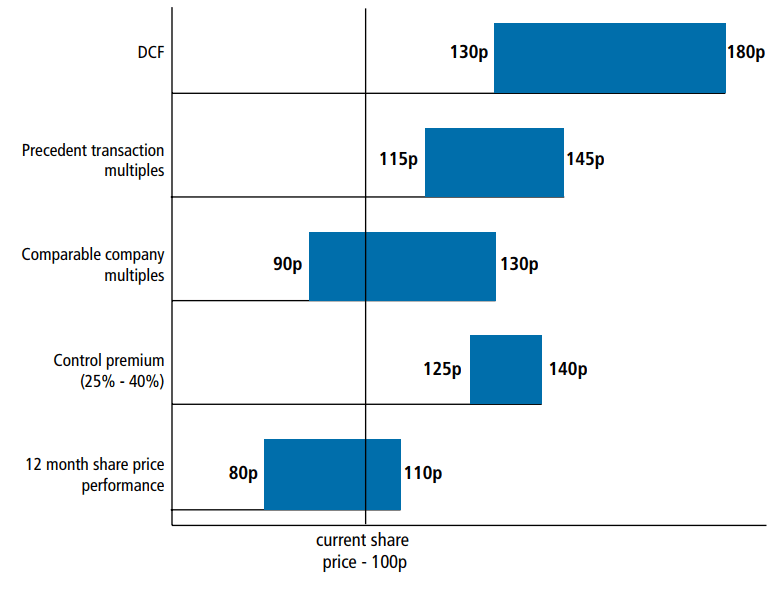 In doing so, the LBO team must see different benefits from paying a premium for the target. Football Field Chart TemplateFootball Field Chart TemplateA football field chart is used to display a range of values for a business. Download our FREE Excel football field chart template and learn how to make one.